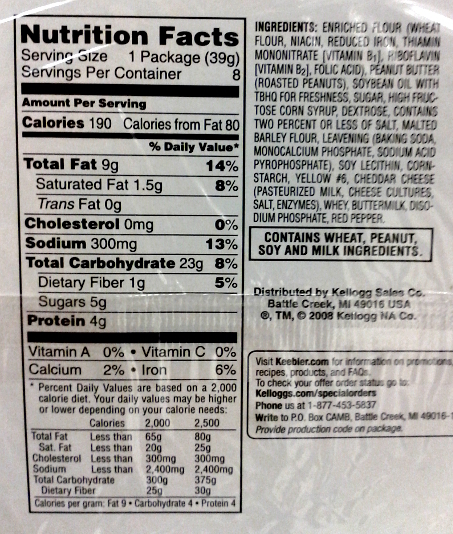 Learn how to read food labels for allergens. More specifically, learn what a food label does and does not tell you. What the law says: In the U.S., the Food Allergen Labeling and Consumer Protection Act of 2004, which applies to most labeled packaged foods sold in the U.S., requires food makers to list ingredients that are on the list of top 8 food allergens — peanuts, tree nuts, milk, eggs, wheat, soy, fish, and shellfish — in clear, plain language on food ingredient labels. This labeling requirement applies to the allergenic food itself and to most products derived from that food. So for example, if a granola bar contains peanuts as an ingredient, the package must list “peanuts” in the ingredient list on the label in plain English; a company is not allowed to say “nuts” or “groundnuts” or “legumes,” or use the Latin name for peanuts, “arachis,” instead. 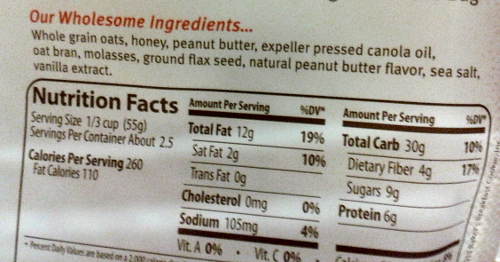 If a granola bar does not contain whole or chopped peanuts, but instead contains peanut butter as an ingredient, the company still has to let you know on the label using plain language that their product contains peanuts by calling peanut butter “peanut butter”– not “nut butter” or “protein butter.” If a granola bar contains peanut flour as an ingredient, the ingredient label on its package can’t just say “nut flour” or “vegetable protein supplement” or “natural flavoring” or “spices”– it has to say “peanut flour,” because that According to FDA rules, if a packaged granola bar contains peanuts, peanut butter, or peanut flour as an intentional ingredient, the ingredient label on that granola bar has to mention, one way or another, that the granola bar contains peanuts. That’s the good news on food labels. Now here comes the not-so-good news. 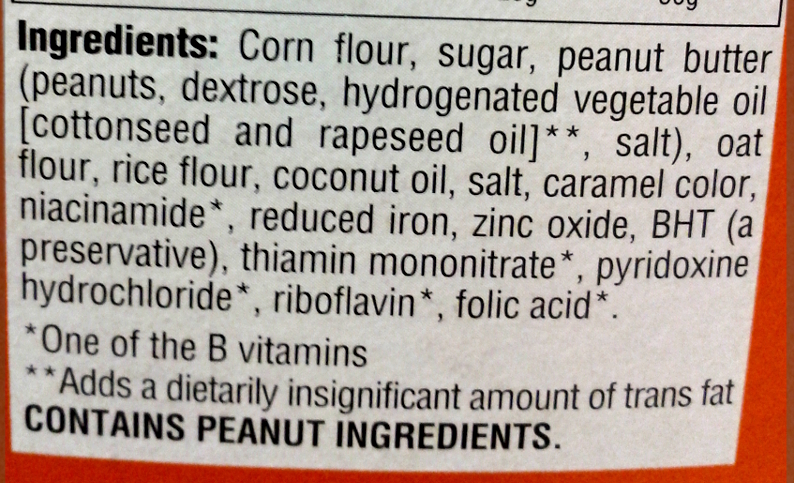 Note: One tricky exception to the FDA labeling rule on peanuts and peanut-based products is peanut oil. There are multiple types of peanut oil, and only some are required to be listed in ingredients as an allergen under FDA rules. The allergenic component of peanuts is the protein, not the fat. To make peanut oil, food manufacturers separate the oily fats contained in the nut from the protein and starch, so peanut oil contains less protein than a whole peanut, peanut butter, or peanut flour. However, this does not mean that all types of peanut oil are protein-free and therefore safe for people with peanut allergies to consume. Cold pressed peanut oil, the type commonly used in gourmet foods and Chinese dishes, has been shown in multiple studies to contain enough protein traces to cause an allergic reaction. 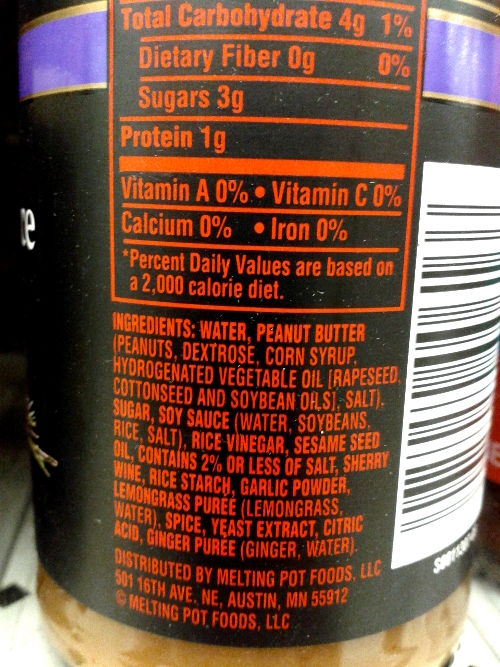 “Crude” or “gourmet” peanut oils also contain significant protein traces. However, highly refined peanut oil, the type often used in high-heat deep fryers, is subject to a thorough filtration and distillation process that is meant to remove nearly all of the allergenic peanut protein. Since so much of the protein is removed, some experts consider highly refined peanut oil to be mostly-allergen-free. 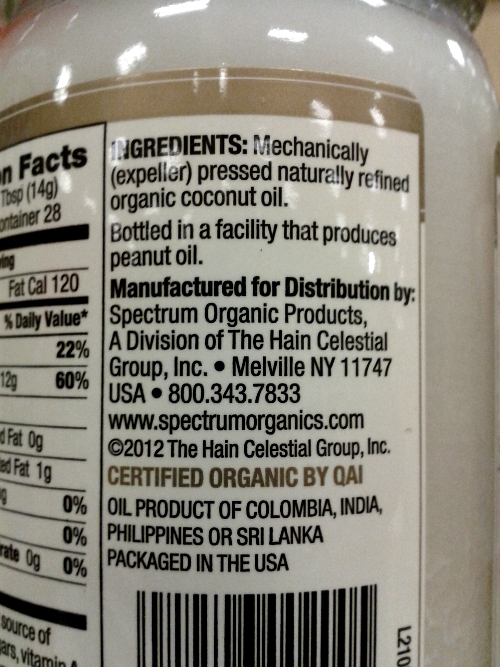 Therefore the FDA does not currently require food companies to label highly refined peanut oil as an allergen. However, many allergists advise their peanut allergic patients to avoid all forms of peanut oil, both because it can be difficult to tell from a label whether peanut oil is highly refined type or not, and because some allergists are concerned that any minor error in the processing of highly refined peanut oil might cause more peanut protein to wind up in the oil than the manufacturer intended. Since the FDA does not treat highly refined peanut oil as an official allergen, if your allergist has advised you to avoid it, you will need to be extra careful about checking for it in ingredient lists. Also note: Not all food sold in the United States is regulated by the FDA, and not all of it is subject to FALCPA allergen labeling rules. FDA labeling regulations only apply to certain packaged foods. FDA packaged food labeling laws do not apply to fresh produce, because fresh produce does not come in a package. So there is no label to tell you what, for example, might be in the food-grade wax sprayed on that apple to make it shiny. FDA labeling laws also do not apply to eggs, poultry or other fresh meats, because those foods are regulated by the USDA. The USDA just “encourages” the food makers under their jurisdiction to follow the FALCPA guidelines; they are not technically legally required to do so. So if a meat packer chooses to inject a chicken breast with soy broth to plump it up, they are unfortunately not legally obligated to list soy in plain language on the label, even though it is a top 8 allergen. And guess what: Those FDA labeling rules that require companies to list allergens in clear language somewhere on the ingredient label only apply to top 8 allergens that are intentional ingredients. 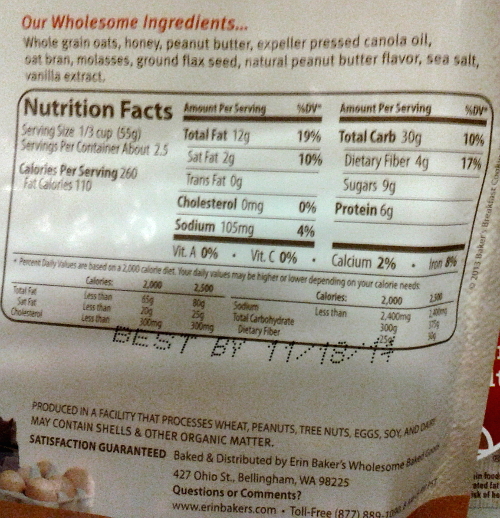 The FDA does not require food manufacturers to put any sort of warning label on foods that may contain peanuts, or any of the other top 8 allergens, by accident. What do I mean when I say foods that may contain peanuts “by accident”? Well, picture this: an ice cream factory makes five flavors of ice cream on the same equipment. Each day, the factory workers starts the morning by thoroughly cleaning the factory equipment. Then they run a batch of vanilla. Then they run the strawberry flavor. Then rocky road– with almonds and peanuts. Then peanut butter flavored ice cream. Then chocolate. Think for a minute. Are you sure there aren’t any almonds, peanuts, or traces of peanut butter ice cream in the chocolate ice cream? Now imagine a flour company that grinds almond flour, chickpea flour and peanut flour in addition to wheat. On different machines. But all in the same room. Can you envision the little puffs of different types of flour rising into the air all day, every day? 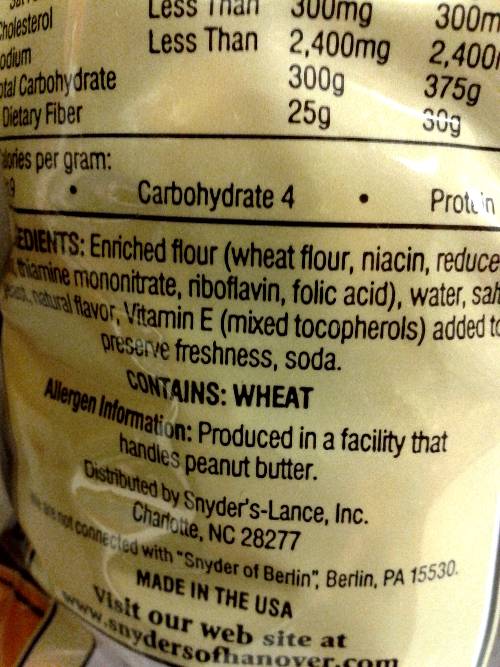 How sure are you that the wheat flour does not contain traces of peanuts? The fact is, a lot of factories make foods containing peanuts on shared equipment or in shared facilities with other foods that do not contain peanuts, and it’s not always the case that shared equipment is cleaned thoroughly enough between products or that products in a shared facility are kept segregated enough to prevent trace amounts of peanuts from getting mixed in with other foods. When peanuts or other food allergens make their way into foods that are not supposed to contain them by mistake, it’s called cross-contamination or cross-contact. And the FDA does not require companies to label foods that are at risk for cross-contamination with peanuts. You may have seen warning labels on foods that say things like “may contain peanuts” or “made on shared equipment with peanuts.” But those labels are entirely voluntary, and not regulated by the FDA. So if you want to be absolutely sure that a company operates a nut-free facility, or has guidelines in place to prevent food allergen cross-contact that are good enough to make you comfortable, unfortunately, you are going to have to call or email that company directly to ask, or go hunting for that information on the company website. Listed in the ingredient list. Listed in the ingredient list and then mentioned again in bold type at the bottom. 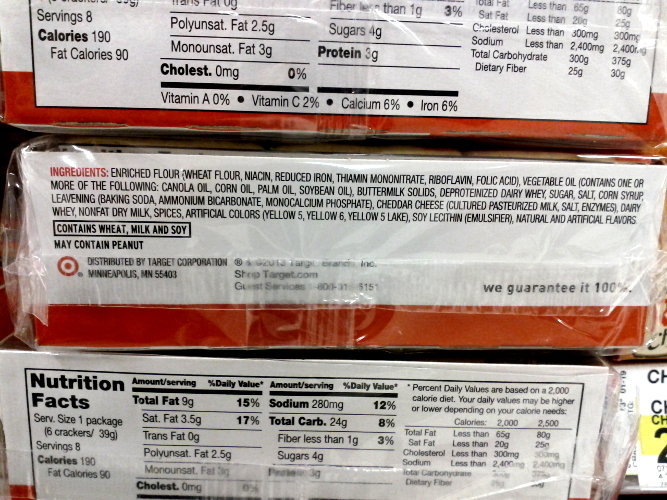 Listed in the ingredient list and then mentioned again in bold inside a box, along with some other top 8 allergens. Listed in the ingredient list . . . Followed by a warning at the bottom that this peanut butter granola that the ingredient list states contains peanuts is made in a shared facility with peanuts. All of these ways of listing peanuts as an ingredient are legal according to FDA FALCPA allergen labeling guidelines, which only require that peanut-based ingredients be clearly listed as peanuts (instead of as something mysterious like “natural flavoring” or “spices”) somewhere on the ingredient label. Not every label will list allergens in the same way. Those companies that list allergens in bold, in boxes, and/or in a separate allergen list are doing so voluntarily. As mentioned above, these types of labels, called allergen advisory labels, are entirely voluntary, are used in different ways by different companies, and are not regulated by the FDA. 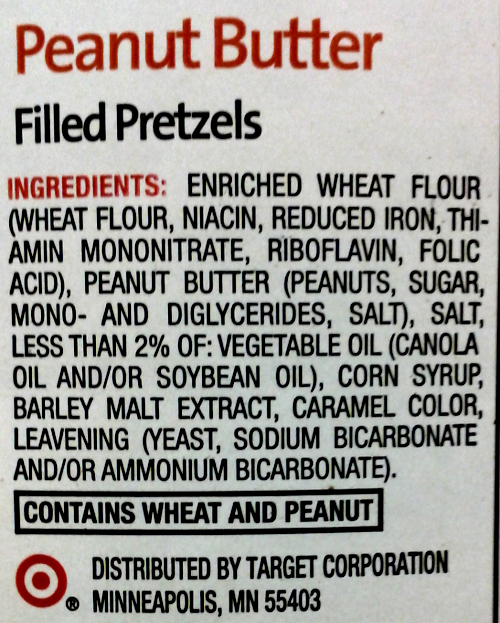 There is no legal difference between a label that says “may contain peanuts” and one that says “may contain traces of peanuts,” “made on shared equipment with peanuts,” or “made in a shared facility with peanuts.” But just because these labels are voluntary and unregulated doesn’t meant that people with peanut allergies should ignore them. Two separate studies done on foods with allergen advisory warnings have shown that anywhere from 5% to 10% of random samples of foods labeled with cross-contamination warnings for peanut do indeed contain detectable levels of peanut residue. But what about those foods that aren’t labeled for cross-contact risk? Sadly, because allergen advisory labels for cross-contact list are not mandatory, there is no easy way to know from reading a label alone whether a food item may contain traces of peanuts. Even the words “no nuts,” “peanut-free” or “nut-free” on a label can be misleading. Since FALCPA labeling rules only apply to intentional ingredients, under current law, it is actually perfectly legal for a company to print “No Nuts” on the front of a package and “Made on shared equipment with peanuts” on the back. Perhaps more importantly, it’s also perfectly legal for a food maker to print “No Nuts” on the front and not print an allergen advisory warning anywhere on the package even if a product might contain traces of nuts due to the manufacturing process. 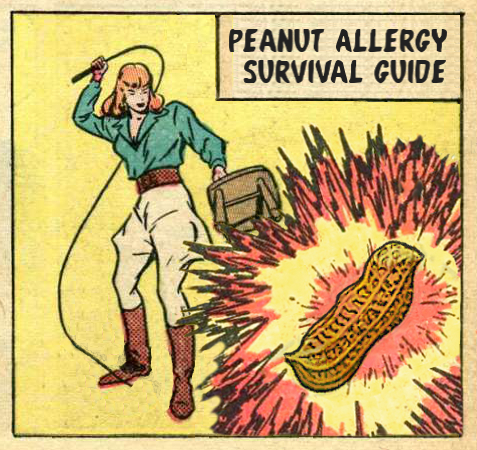 As little as 1/100th of one peanut can cause allergic symptoms in a highly sensitive person. If you are highly sensitive to peanuts and your allergist has advised you to avoid all foods that may contain traces of peanuts, the loopholes in U.S. allergen labeling law can pose a huge challenge. But there is help out there when it comes to figuring out which companies voluntarily label well for cross-contact risk, and which don’t. 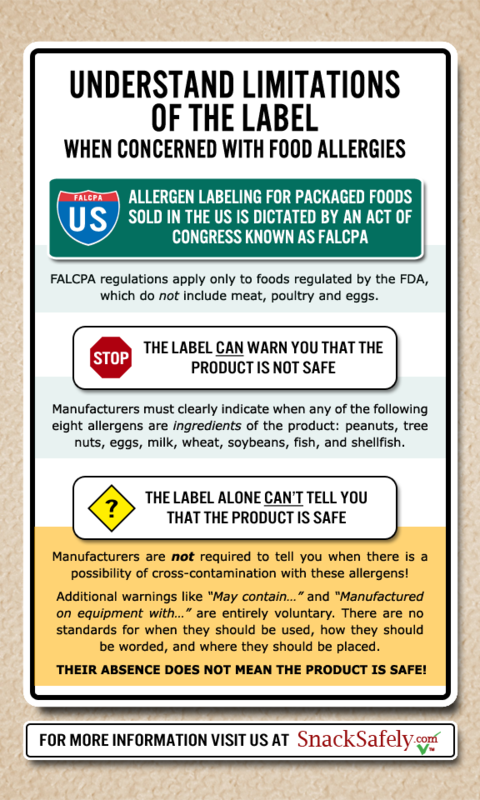 Trust The Label shares useful information about major food manufacturers’ allergen labeling policies, including whether a company makes it standard policy or not to label for the chance of cross-contact with top 8 allergens. Snack Safely provides a regularly updated safe snack list for people with peanut, tree nut and egg allergies and has partnered with a number of responsible food manufacturers who have pledged share clear allergen information with consumers. And allergy-friendly specialty retailers like Peanut-Free Planet provide a source for peanut-free foods that can be hard to find elsewhere. You can also try checking food companies’ websites for more detailed allergen information than what appears on the ingredient label, or try emailing a company directly or calling a customer help lines to ask specific questions. You can also visit the peanut allergy information page at Food Allergy Research and Education (FARE) to learn which foods are more likely than others to either contain peanuts as an ingredient or be contaminated with peanuts, plus much more about the sneaky ways peanuts can hide in your food, particularly at restaurants. Unless otherwise noted, the photos of food labels on this page were taken by Jaelithe Judy with a terrible cell phone camera. Please feel free to reuse these food label photos for educational purposes.